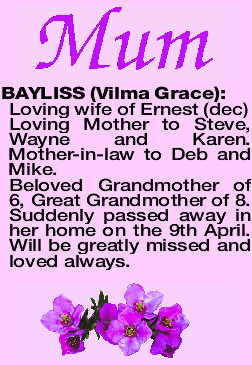 The Funeral Service to celebrate the life of Mrs Vilma Grace Bayliss of Mandurah will take place in our Chapel 2 Leslie Street, MANDURAH commencing at 2:30pm THURSDAY (18.04.2019). 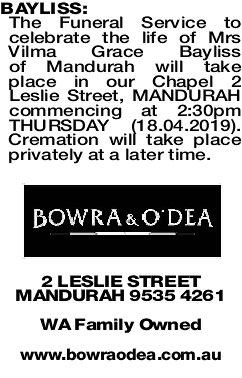 Cremation will take place privately at a later time. Loving Mother to Steve, Wayne and Karen. Mother-in-law to Deb and Mike. Beloved Grandmother of 6, Great Grandmother of 8. 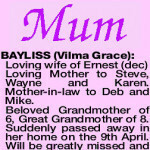 Suddenly passed away in her home on the 9th April. Will be greatly missed and loved always. 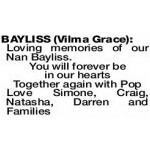 BAYLISS VILMA GRACE Loving memories of our Nan Bayliss.